Although chiropractors care for more than just back pain, many patients visit chiropractors looking for relief from this persistent condition. Back pain is one of the most common health problems of today. 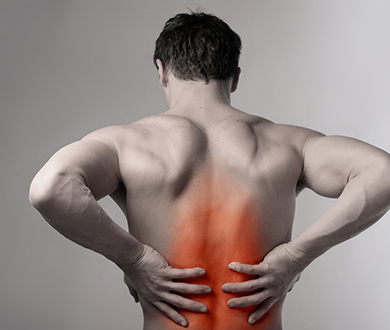 It is estimated 75 million people will experience some type of back pain each year. Over 80 percent of the adult population experienced back pain at some time in their life. For those in the age group of 30-50, it is the most common cause of disability. of the work force and the economic affects of low back pain are significant. The back is a complicated structure of bones, joints, ligaments and muscles. You can sprain ligaments, strain muscles, rupture disks, irritate joints; all of which can lead to back pain. While sports injuries or accidents can cause back pain, sometimes the simplest of movements—for example, picking up a pencil from the floor— can have painful results. In addition, arthritis, poor posture, obesity, and stress can cause or complicate back pain. Back pain can also directly result from disease of the internal organs, such as kidney stones, kidney infections, blood clots, or bone loss. Stress and Tension: Emotional stress and tension results in tight muscles, which produce pain and stiffness. Poor Posture: Sitting incorrectly or standing for long periods of time can produce back pain. Be careful of your work posture or positioning. Physical Work: Heavy physical work, including lifting or forceful movement, bending or twisting is often associated with low back pain. Improper lifting techniques can not only cause, but also aggravate low back pain. Daily Activities: Normal activities of life can cause muscle strains and sprains leading to back pain. It is not uncommon for activities like gardening, biking, horseback riding or even golf to hurt your low back. Accidents and Injuries: Auto accidents, sports injuries, slips and falls and other trauma can result in back pain. Weight Gain: The additional pounds from being overweight can produce pressure and stress on the low back resulting in pain. Aging: As we age, ligaments thicken and discs dry out. These changes may lead to problems that put pressure on the spinal nerves producing back pain. At Allied Chiropractic in Hillsboro, we offer a comprehensive treatment program for back pain sufferers. The primary treatment for back pain is a chiropractic adjustment. This procedure is a gentle, low force re-alignment of the spinal bones (vertebrae). The result is restoration of joint function and stress reduction to the spine and nervous system. It is common to find most back pain sufferers to be stiff and inflexible. To aid in correcting this, flexibility and stretching programs are designed to improve and restore pain-free range of motion. If the low back pain is the result of an old injury that was not treated properly or rehabbed, additional balance and stabilization rehabilitation activities will be performed. The goal is to improve spinal structural integrity and coordination. The ultimate strength of the spine is the strength of the supportive soft tissue: the muscles. As suspension cables support bridges, the muscles of the back support the spine and determine its strength and durability. It takes only one weak muscle to produce reoccurring back pain. A functional evaluation to determine muscle weakness is necessary to prescribe the correct strengthening exercises. This is necessary to gain relief and to stay out of pain. If you have back pain when you cough or sneeze.